1. Where do you store your makeup? I store my make up in a draw, and my skincare products in the bathroom draws. 2. How many makeup products do you own? Too many! I do try to cut down the amount I have, as I think I own way too much. I'm really good at mascaras as I only have 3, each have different brush. 3. 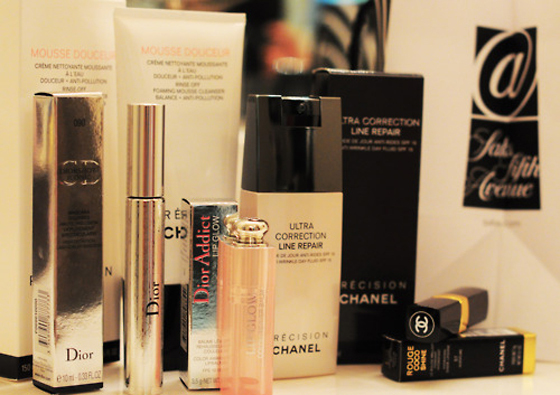 How many makeup products do you actually use daily? 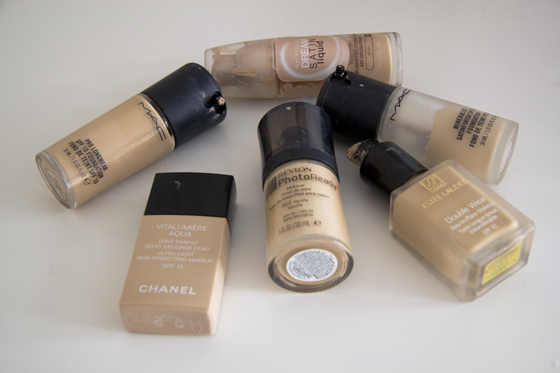 Foundation I mix two, powder, concealer, bronzer, lipstick, eyeshadow, eye liner and mascara. 9 products in total. When I feel like I want to add more I will use blusher or highlighter. 4. How many eyeliners do you own? I only have one it's the L'Oreal Carbon gloss, I actually had run out of it recently so I will pick it up once again. I'm also planning to try another one. So I'm pretty good with eyeliners, I'm not a fan of kohl eyeliners. 5. How many foundations do you own? I recently done a post on that, you can find it here. I had 6 but now I have one more in my collection. So it's 7 in total. 7. How many concealers do you own? I have 3, one with small coverage, 2nd with more coverage and the 3rd is the one I don't like. 8. How many Mascaras do you own? I have 3, all of them have different wands. So I don't think that to bad, I normally go buy a new one when I run out of my old one. Max Factor False lash effect, Rimmel lash accelerator and L'Oreal Volume Million Lashes, I do like all. 9. How many Lip Glosses do you own? Around 15? Most are sample size or received as a gift. I hardly ever buy any lipglosses myslef as I don't like to wear them that much. Long hair + wind, big problem! 10. How many Lipsticks do you own? I have around 24, that so much! But I can't help myself! I love lipstick too much. All my colours are different, so nothing repeats. I do use them on daily basic. 11. How many nail polish do you own? Too many! Once again all have different colours. The last time I counted I had 36. I didn't buy any new ones for long amount of time. 12. How many Eyeshadows or Eyeshadow palettes do you own? I have 2 Naked palettes, 2 MUA palettes, 1 Accessories palette (I got it when I bought a perfume) and Elf one. I have 3 single eyeshadows. 13. How many Perfumes do you own? Right now we have four (I share perfumes with my mum). Marc Jacobs Daisy, Paul Smith Sunshine, Prada Candy and I Calvin Klein one. I hoped you liked the tag, if you feel like you want to do it, go for it. I tag everyone. *Click through credit on the first photo, the second one belongs to me.